In the recent post in which I declared 2014 to be the "Year of the GameBoy," I warned folks that they should expect a good number of GB-focused write-ups in the coming weeks and months. This isn't really the kind of post I was talking about, but it is related to them. 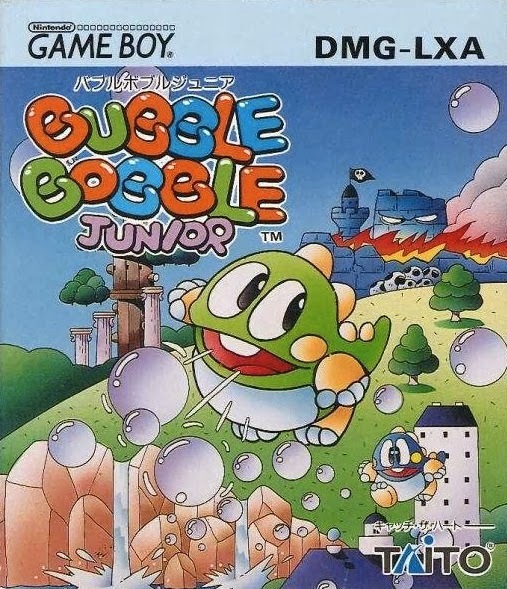 After all, one of the things that has pushed me to turn my attention, once again, to Nintendo's first handheld system is the cool, quirky and even beautiful box art that was created for some of its Japanese titles. The following five pieces of cover art certainly deserve to be tagged as cool, quirky or beautiful--if not all three--or at least I think they deserve to be tagged as such. What do you think? 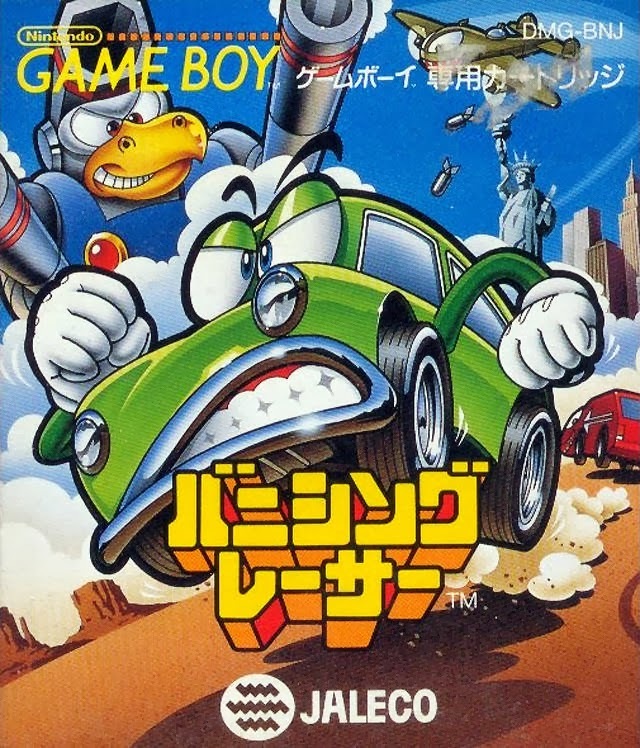 Banishing Racer--I only became aware of this Jaleco-made platformer--which stars an anthropomorphic car that hops and bops its way across the US--a few months ago, but I've since made up for lost time by basically falling in love with it. Truth be told, the game itself is far from amazing and even can be downright frustrating at times, but I've never been overly picky and I've always been a bit of a masochist, so neither of those things bother me too much. Granted, I may be more lenient on the game than I should be because of its colorful--and kind of hilarious--box art. Hoi Hoi--Seriously, how can you not love a piece of cover art that features a gigantic, grinning--and winking--cockroach? I also like the kiddies that appear on this one, thanks in large part to the rosy cheeks that make them look like they belong in a cartoon or comic from the early 1900s. Thankfully, the gameplay--which can only be compared to modern tower-defense titles--in this one is worth a second glance, too. Kitchen Panic--What? 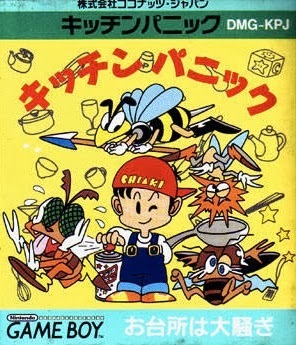 Another piece of Japanese GameBoy cover art that showcases illustrations of insects? Yep! 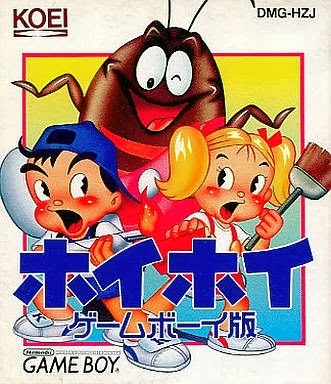 Unsurprisingly, those bugs are the star attractions here, with my personal favorite being the bee or fly or spider or whatever you want to call the thing on the left (the one that's crying and holding its face with two of its many hands). Lock 'n' Chase--After all of the drama above, you're probably surprised I'd decide to include such a "boring" piece of box art in this post. The thing is, I've always liked how this game's Pac-Man-like protagonist is depicted here. Plus, I like the overall use of color in this creation. A really attractive and well-balanced cover, in my humble opinion. *snort* ear of GameBoy. Might want to fix that...although it's giving me hilarious mental images. Kitchen Panic's Ness-like protagonist look like he's got things under control there. I love it. And that last box really is perfectly balanced. Ha! Sigh. I must've written this at night last week, after dinner (and a glass of wine. Anyway, thanks for pointing out the "ear" part! Yeah, the box art for Hoi Hoi has got me hungry for Campbell's soup, or would if it weren't for that roach. I guess the game was called "Stop that Roach!" in the US, an indication that Koei had no idea how to market it here. The Lock 'n Chase art reminds me of the American version, except the US game was heavily airbrushed and full of early '90s attitude. "Oh no, the cops are after me, doods! Bogus!" Ah, yes, Hoi Hoi's box art does bring to mind Campbell's marketing in the past, doesn't it? And, yes, it was sold here at "Stop That Roach!" I can't say I ever recall seeing it or otherwise being aware of it back in the day, but I also doubt it was widely available. Have you played it, BTW? It's ... interesting. I'd be hard pressed to call it good, but it's definitely unique. 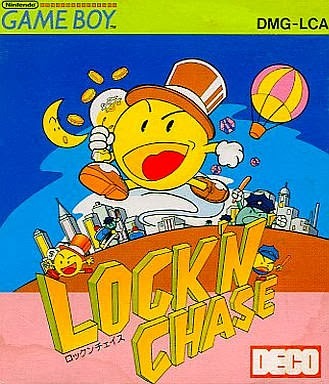 As for Lock 'N Chase: I don't hate the American box art, but I definitely like it less than the Japanese art. Like you said, the NA art is too 1990s for me. This Lock n' Chase definitely has some charm that the US version doesn't, though I like them both. There's something about the character's expression here that's very appealing. Banishing Racer (what a strange title) is adorable, I've never heard of it before! I'm sure I can think of other "car platformers" like this but for some reason after watching a clip of this one I'm particularly charmed. What a lot of trouble that car manages to get into! And of course, any time an angel wants to come down and restore my car to like-new condition would be fine by me. Also, yes, I like the expression on the protagonist's face on the JP box art, too. And did you notice that the protagonist is being chased along the top of the logo by a cop-thing? How cute is that? Ah, glad I could make you aware of Banishing Racer, Michael. It really is charming, isn't it? And, yes, I've definitely seen the cover of City Connection before. Not only that, I've played quite a few versions of the game--from the Famicom/NES version to the arcade original. As for a, er, connection between City Connection and Banishing Racer--the guy behind the great blog, VGJunk, recently suggested this, too, and I have to agree with him. After all, there's even a level (or series of levels) in the latter that resemble the former. As such, I have to imagine Banishing Racer was influenced by Jaleco's earlier title. Maybe the company's developers were like, "hey, how can we turn this idea (City Connection's) into something else, like a platformer?" I did! I was initially confused by it because I couldn't tell he was part of the logo, but I figured it out when I saw the police guy. Man, why would a guy with a golden top hat be robbing banks? It's the very picture of intrigue! Ha ha, yes, it is quite baffling, isn't it? I rather like this poster used to promote the Intellivision version of Lock 'n Chase, myself. People seemed to have a peculiar fascination with Keystone cops back in those days.